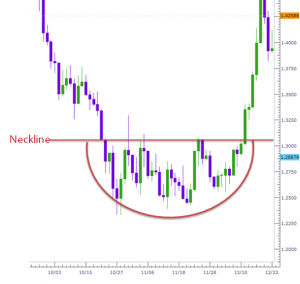 A cup and handle chart is a bullish continuation pattern. As its name implies, there are 2 parts to the pattern: the cup and the handle. The cup forms after an advance and looks like a bowl or rounding bottom. As the cup is completed, a trading range develops on the right hand side and the handle is formed. A subsequent breakout from the handle’s trading range signals a continuation of the prior advance. The cup should be U-shaped, not V-shaped. The cup must have a handle on the right. Ideally, the depth of the cup should retrace 1/3 or less of the previous advance. A rounding bottom, also referred to as a saucer bottom, is a long-term reversal pattern that signals a shift from a downtrend to an uptrend. 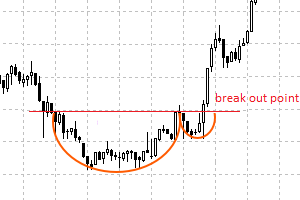 A rounding-bottom pattern looks similar to a cup and handle, but without the handle. 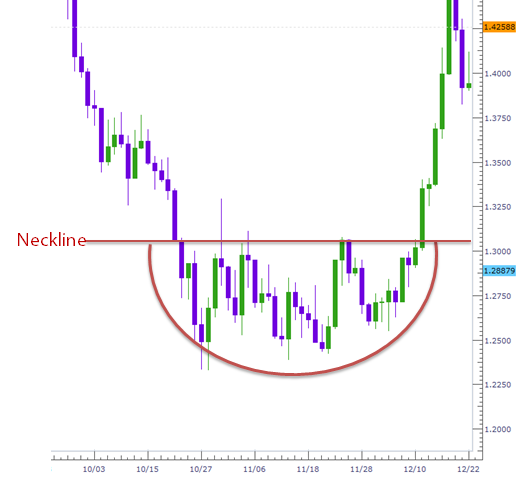 The basic formation of a rounding bottom comes from a downward price movement to a low, followed by a rise from the low back to the start of the downward price movement – forming what looks like a rounded bottom. The time distance from the initial peak to the long-term low is considered to be half the distance of the rounding bottom. In an ideal pattern, volume levels will track the shape of the rounding bottom: high at the beginning of the decline, low at the end of the decline and rising during the advance. Breakouts in chart patterns should be accompanied by a large increase in volume.